Make learning time fun and easy with this colourful addition to your child's bedroom or nursery! We are delighted to launch our exciting new range of children's personalised wall clocks. 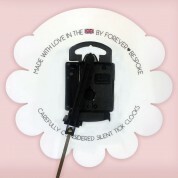 The silent tick mechanism makes them perfect for a baby's nursery. 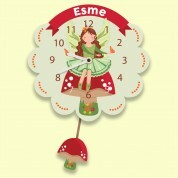 Each includes an adorable swinging pendulum, adding a novelty finish to each clock. Our pretty butterfly fairy is sitting on a toadstool in a magical fantasy forest. A red banner includes your child's name (there is space for two first names if the children share a room). A swinging toadstool completes the design. The clock is designed and made in the UK and features a quality German Quartz movement which compliments the quality of the British design and manufacture. A perfect gift for any occasion – a first birthday, Christening, Dedication – or even for starting school! Other designs are available. Requires 1 AA battery (not supplied). Please take care when hanging your clock.